Section 194-I of the Indian Income tax Act, deals with the deduction of tax at source from payment of rent. The tax is required to be deducted by specified classes of assesses on payment of rent above specified limit at a prescribed rate. Budget 2017-18 has proposed to insert a new section 194-IB to cover more taxpayers. 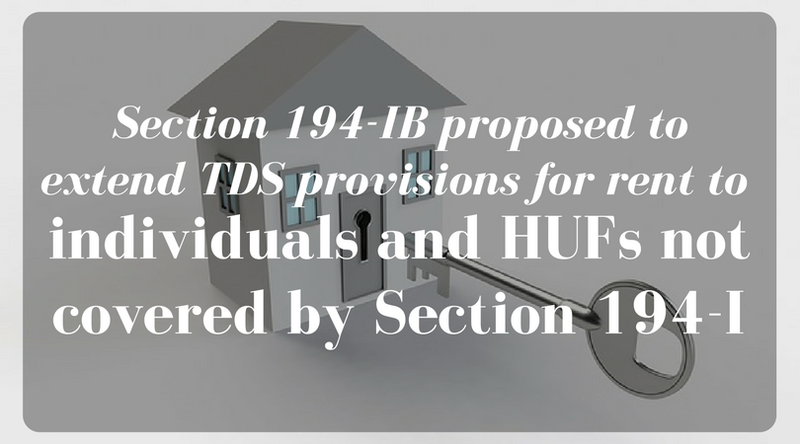 Section 194-IB requires individuals and HUFs paying rent over INR 50,000 per month or part of the month to deduct TDS @5%. It extends to only those individuals and HUFs which are not covered under tax audit. Section 194-IB applies only to individuals and HUFs and that’s too which are not covered under tax audit. To attract section 194-IB, rent payment must exceed INR 50,000 for a month or a part of month. The section prescribes a limit of INR 50,000 per month or part of month to attract TDS. The language of the section as per Finance bill mentions “paying to a resident any income by way of rent exceeding fifty thousand rupees for a month or part of a month during the previous year”. This implies that if rent is less than INR 50,000 per month as per agreement, tax is not to be deducted on any advance payment exceeding INR 50,000. Rent pertains to use of land or building or both. Section 194-IB covers only rent relating to use of land or building or both, unlike Section 194-I which extends to plant, machinery, furniture and fittings as well. 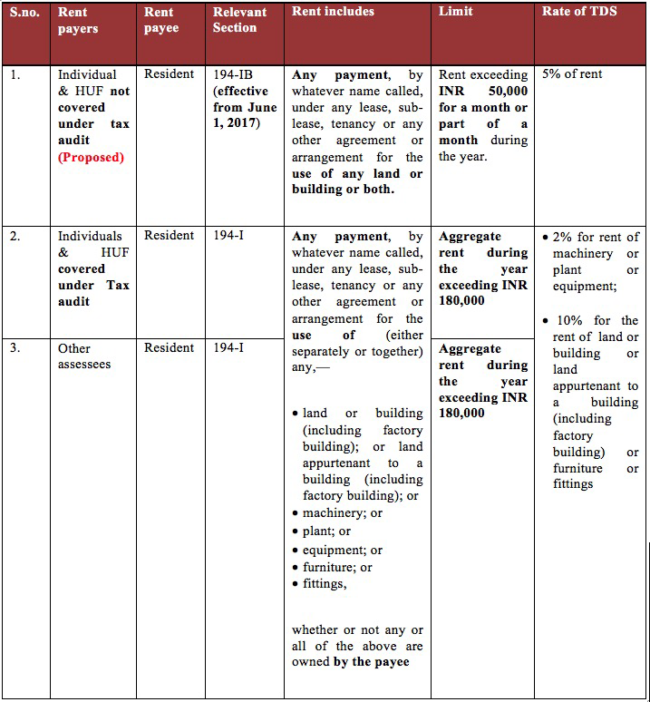 Clarity is however needed in respect of rent for use of land appurtenant to building which is a clearly specified head under Section 194-I. Tax is to be deducted at the rate of 5% on the rent payment. Does Section 206AA will apply in case of Section 194-IB as well? Yes, Section 206AA will apply but with an exception. In case Section 194-IB applies and payee fails to furnish PAN or submit inaccurate PAN, tax is required to be deducted as per the provisions of section 206AA. However, such deduction shall not exceed the amount of rent payable for the last month of the previous year or the last month of the tenancy, as the case may be. Coming to the procedural aspects, when tax needs to be deducted? Section 194-IB lays down that the tax is required to be deducted at the time of credit of rent for the last month of the previous year or the last month of tenancy, if the property is vacated during the year. For example, ABC Ltd pays a rent of INR 60,000 for use of office building owned by Mr. Ankush for the FY 2017-18. In this case, section 194-IB is attracted and tax is to be deducted at the time of crediting the rent for the month of March 2018. Tax will be deducted @5% on INR 720,000 (60,000*12). *Please note that the incidence of tax deduction under Sec. 194-I will arise at mere incidence of crediting to the rental income in the lessee‘s books of account, be it even a suspense account. The Explanation (ii) to sec. 194-I deemed such crediting to be credit of such income to the account of the payee. Section 194-IB does not provide for such deeming incidence. Do I need to obtain Tax deduction number if I am covered under Section 194-IB? If you qualify to deduct tax under Section 194-I, you have to obtain “Tax Deduction Number (TAN)” in terms of Section 203A. You would need to quote this TAN in challan, certificates or returns as specified for the purpose of Section 194-IB. Budget 2017-18 has proposed to not apply Section 203A to person deducting tax under Section 194-IB. Accordingly, an individual or HUF deducting tax under Section 194-IB are not required to obtain TAN. Only PAN is sufficient. Once the proposed section 194-IB is notified, we expect rules to come to provide clarity on time limits as well as other procedural aspects. As per rule 31, every person responsible for deduction of tax from payments other than salary has to issue a quarterly TDS certificate in Form No. 16A. Once the proposed section 194-IB is notified, we expect rules to come to provide clarity on TDS certificates as well as other procedural aspects. Hope you find the article useful. Pour in your comments and help us improve. Stay tuned and keep visiting www.taxingtax.com for more updates.